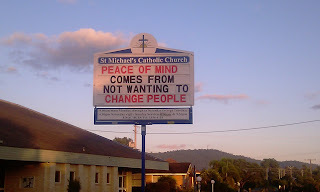 Churches and schools around Brisbane often use display signs to announce upcoming events or communicate words of wisdom. Most remain outside the digital age, and have a manual sign like the one shown above. They all seem to have a set of black and red letters, and the signs usually incorporate a combination of black and red words within their messages. I often notice that key words are put up in red … presumably to attract the attention of passers-by. There’s some logic in the idea that the most important bits should be in red. The red certainly works to attract attention, but it has a problem in terms of legibility. The red words are much more difficult to read than the black words. Reading the red requires readers to be closer, and it takes more time. This is because the contrast between the red letters and the white background isn’t as great as the contrast between the black letters and the white background. 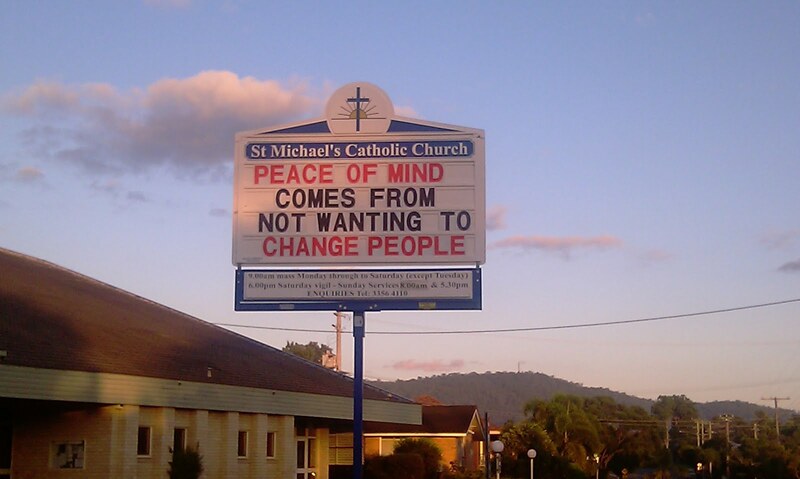 I’ve been going past the above example every morning this week, and I always notice that I can read ‘comes from not wanting to’ well before I can make out ‘peace of mind’ and ‘change people’. So while the red grabs attention, it doesn’t help with legibility. The organisations that craft these messages might benefit from using their red letters for their least important words – so that the red can attract attention while allowing the message to be easily read from the greatest distance possible.